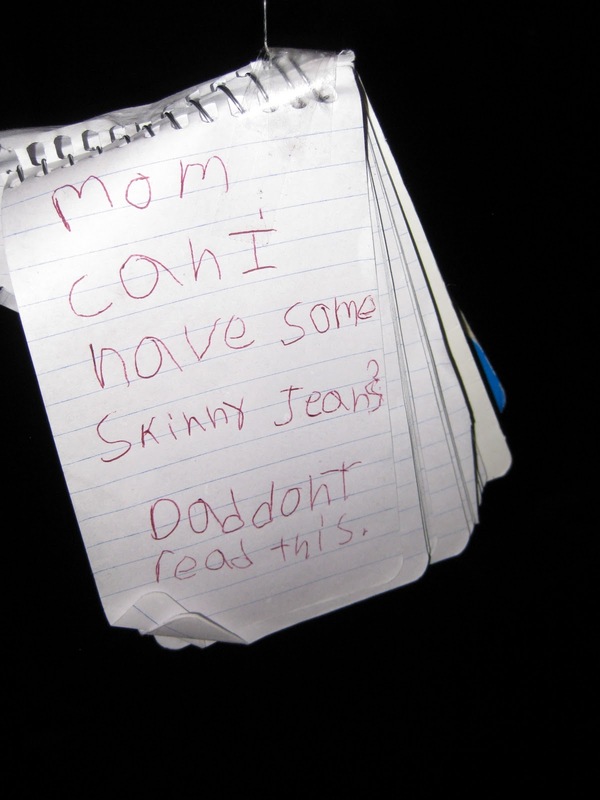 John and I came upstairs after watching TV the other night and found a note hanging at eye-level in the kitchen doorway. I laughed out loud and called into the other room to see if John had seen it. “Yes,” he replied, “but I didn’t read it.” I noticed Lily’s clever engineering, dangling the notebook at just the right height from the balcony above using fishing line. Fishing line? I didn’t even know we owned any fishing line. I imagined Lily scurrying around quietly, carrying out her plan, while we thought she was asleep. Lily is always hatching some kind of strange but clever plan. Sometimes, I’m not sure she consciously knows she’s planning something. It’s like something inside her compels her to carry out these creative missions without any forethought. She never tells us when one of her plans is underway, so then she gets frustrated if we unknowingly interrupt her or if say, Dad throws away the special stick she was saving to carve into a native American fishing spear, or we’ve moved (aka put away) the tape, glue, paper, pipe cleaners, etc. that she had planned to use for some masterpiece. Last summer, Lily kept complaining about growing pains. One day, when I dropped her off at daycare, I noticed a flash of purple peeking out of her socks. I called her back to the car and discovered that her ankles were wrapped with purple duct tape. “It makes my legs feel better and makes me run faster,” she told me. She probably kept that tape around her ankles for a week. This summer, we went away for the weekend as a family. The first night, when we laid down in the hotel room, I noticed that Lily had a little plastic makeup bag she kept opening and sniffing. Weird. When I asked her what she was doing, her little sister told me that Lily was smelling what was inside the bag to remind her of home. Lily wouldn’t tell me what was in the bag, but she said that it relaxed her. OhhhKaaay. Whatever it was, I knew that somehow she secretly scrambled around the house to prepare it before we left. The girl can barely remember to put on shoes before we leave the house, but she sure didn’t forget to mix up some homemade spices and put them in a makeup bag so she could sniff them in a hotel room. I still don’t know exactly what was in the bag and I guess I don’t really want to know, but when we came home I did find an empty jar of mustard seed. Many of Lily’s mysterious plans involve cinnamon, lemon and the kitchen. I had to put a ban on her concoctions for awhile because of the messes she left behind. She’s definitely not a ‘by the book’ cook. She dreams up crazy drinks and soups that are actually pretty delicious. One night, she was especially excited to have us sample the dessert she had made. She coated Honey Bunches of Oats with melted chocolate chips, put the mixture inside a biscuit-cutter to form it, sprinkled it with kosher salt and put it in the freezer to set up. It was really good! I came home from work this week and was greeted by Lily wearing a suit jacket and skirt and carrying a notebook and pen. She told me that she was a newspaper reporter and wanted to interview me about the recent rash of bear visits in our neighborhood. Later that night, she presented us with her newspaper article, which for a twice exceptional kid who has difficulty with writing because of her fine motor issues and Executive Function problems, was amazing. Back to the skinny jeans–we bought her a few pair for school. Lily puts her outfits together like she cooks. Crazy combos that work, usually involving a jaunty hat and a poncho flourish. She definitely has a funky style, but I know her skinny jean note was prompted by the approach of middle school. Argh.